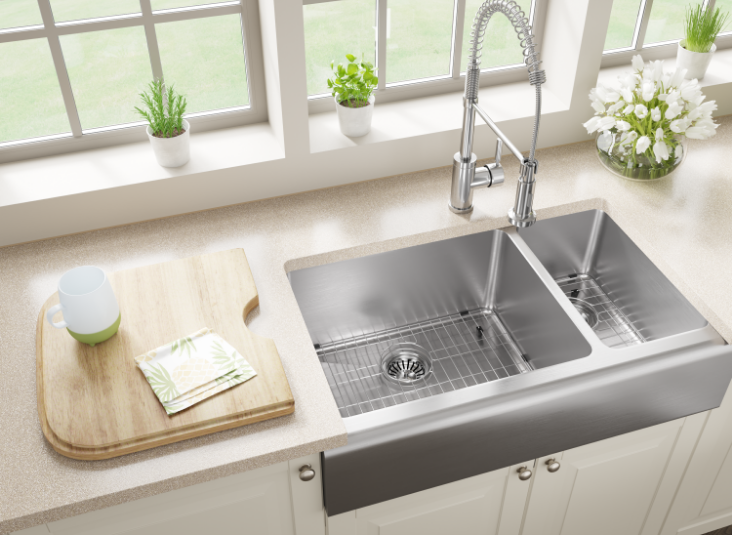 Stainless steel sinks are the heart of kitchens everywhere. Dishes flow in and out throughout the day and they rarely ever get a break. So, at the end of the day when it’s time to clean up, your sink deserves a little TLC. Many people like to freshen the scent of their sink by scrubbing it with leftover lemons, however, it’s always great to go that extra mile to keep your sink as polished as the day it was installed. When life gives you lemons, sure you make lemonade, but you shouldn’t stop there! The fresh scent this citrus sensation offers is definitely safer than any harsh chemicals used to clean sinks. It’s a well-known hack to use the remainder of a lemon to deodorize your sink, however, did you know you can get a little more out of them? Step 1: Sprinkle some baking soda to cover the bottom of your sink and squeeze the lemon juice over the top. Let it sit for about 7 minutes. Step 2: Use your sponge (or you can use the lemon flipped inside out) to mix the baking soda and lemon juice, forming a paste to scrub the entire sink. You can add a bit of water to help form the paste. Let it sit again for about 5 minutes. Step 3: Pour a small amount of vinegar over the paste, making it fizzle away the dullness. Then, continue to scrub and spread the paste all over. Step 4: Rinse the sink thoroughly with hot water and TA-DA! Your sink looks as good as new. Bonus Points: Use the last bits of your leftover lemons to freshen the scent of the garbage disposal by grinding up the peels. The quick journey to a shiny, chemical-free and lemon fresh sink took about 12-15 minutes. I recommend doing this once a week to maintain a long life for your beautiful and clean sink.